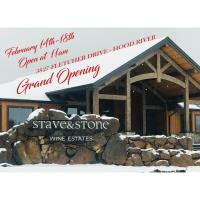 Stave & Stone Celebrates Opening of New Vineyard Tasting Room & Winery with Great Specials! Enjoy a small Cheeseboard and a bottle of Wine with special pricing. 2/15/19- 11-9pm Happy Hour All day.